A young visitor of note [to Globe Mill] was Ralph Blumenfeld, delivering to the mill office business forms printed at his father's shop where was published "The Weltbuerger"—a German language paper of wide local distribution and influence. The smell of printer's ink pointed his career of great prominence in journalism—first at the age of twenty-seven as editor of the "New York Herald" and later in still greater fields as editor and chairman of the Board of the world's most widely circulated paper, "The London Daily Express." Today  at eighty-two, Ralph Blumenfeld has seen his recent book, "Hometown" (Watertown), go into its third edition for his English public. Source: "The Globe Milling Company, Watertown, Wisconsin, 1845-1945." Another Watertown boy, Ralph Blumenfeld, has been heard from in a way pleasing to his many friends, having received a fine promotion. He is now in London, England, filling the position of managing editor of the London edition of the The New York Herald. 01 08 Ralph Blumenfeld, who was born and reared in this city, and a son of Mr. and Mrs. D. Blumenfeld, will probably become the editor of the London Times, London, England, as a result of the change in the ownership of that powerful and historic journal. Mr. Blumenfeld began his newspaper work in the office of the Weltbuerger, the German newspaper in this city, owned and published by his father for fifty years. After leaving that paper he did work as a telegraph operator and then returned to journalism and also became a contributor to many of the leading magazines and newspapers in this country. He rose from the ranks as a “cub reporter,” has been a war correspondent and for a time held a high place in the New York Herald, which he left to join the Paris edition of the James Gordon Bennett publications. He then became managing editor of The London Express, which started the movement in England to Americanize the London press. He has been the right-hand man for the Harmsworth interests. The following article recently appeared in the St. Paul Pioneer Press and tells of early-day immigrants from Germany. The ambitious plumber or baker or butcher of today no doubt would be shocked to learn that men of their trades discoursed learnedly on Main Sreet on certain passages of Theocritus or Homer, Schopenhauer or Kant more than half a century ago. This happened in Wisconsin in the early fifties and sixties, and more particularly so in Watertown according to a story told The Associated Press by Ralph D. Blumenfeld, a former Watertown man, but now chairman and editor of the London (English) Daily Express. Mr. Blumenfeld recites that Watertown became the haven for exiled German educators, lawyers and other learned men, who fled their native land following the revolution of 1848. There was a great influx of these men, says Mr. Blumenfeld. Since they all could not practice law or teach the dead languages, they took to other pursuits, so that it was no uncommon thing to hear on Main street a tavern-keeper, a grocer or a cobbler disputing vigorously on certain dissertations of ancient men of different schools of philosophy. It was a strange and fascinating mixture of the sublime and ridiculous. The editor relates an instance, when the “fancy” baker, depositing his little basket of confections at the Blumenfeld garden gate, joyfully explain to Blumenfeld that he had translated successfully the latest philosophical tract of Bacchilydes. “The music teacher, who imparted to me the secrets of the violin – sometimes rather forcibly – pulled out a photograph showing his uncle in the fell panoply of a minister of state in the old Kaiser’s entourage”, states Mr. Blumenfeld. At that time in Watertown, Mr. Blumenfeld adds, there was but one dress suit, a relic of the forties, although a number of the ladies of the Blumenfeld family circle of acquaintance possessed evening gowns, carefully and reverently laid away in lavender. The first dress suit ever seen by Mr. Blumenfeld was when he was 10 years old, and this was worn by an actor in shows of the “East Lynn” or “Camille” type. Mr. Blumenfeld has been a resident of London for twenty years, returning at times to Watertown, where he says he likes to revisit the scenes of his youth. Ralph D. Blumenfeld, author of "R. D. B's Diary," "R. D., D's Procession' " and "In the Days of Bicycles and Bustles," and one of Great Britain's outstanding newspaper editors who started his career in Watertown, rising to the editorship of The London Daily Express, is hard at work on another volume, this one dealing with boyhood reminiscences of Watertown in the ‘60s and '70s. Word that he is at work on this volume has been coming in for some time. Mr. Blumenfeld is said to be planning to give Watertown's old Sixth ward (now the Sixth and Thirteenth wards) generous mention in his book, because he was born and lived in the old Sixth Ward. The Blumenfeld home was in North Fourth Street, directly north of the Oscar Maerzke home. 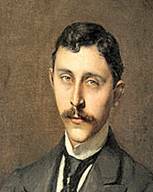 His father was David Blumenfeld, for many years editor and publisher of the German language weekly, Der Weltbuerger. Mr. Blumenfeld, who has paid infrequent visits to Watertown in the last two decades, has nevertheless a great love for his old home town and a feeling of loyalty to his boyhood home. He has never failed to write glowingly and tenderly of this city. And those people from here who have visited him in London, where he has lived for many years, have always come back with words of praise for him. Mr. Blumenfeld visited here in 1921 and has also been back several times since then, but his visits have been brief. Just prior to the outbreak of the war he was planning another trip here and had written that he hoped to spend a winter in Arizona. Before the war he spent his winters in Italy, where he found the climate more to his liking than any Britain could offer, but since the war he has refused to leave London and his country home at Muscombs, Great Easten, Dunmow, Essex. He has gone through repeated bombings and borne up bravely along with the rest of the British people. In his letters to friends here he has also spoken his mind about the Nazi war machine. He never was one to mince words. 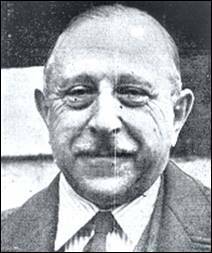 One of Mr. Blumenfeld's favorite American friends is Joseph E. Davies, another native son of Watertown, who has frequently been his guest in England and who served as ambassador to the Soviet Union. Mr. Blumenfeld has paid many tributes in writing to Mr. Davies and Mr. Davies' stature in the British mind can be seen in the fact that the famous British newspaper, The London Times, known as "The Thunderer," recently devoted an entire column to a report of the address Mr. Davies gave a short time ago at the governors' conference at Columbus, Ohio. The article appeared in the issue of Sunday, June 22. For anyone to get an entire column in a newspaper in Great Britain these days, where newsprint is rationed, is somewhat of a feat in itself. The column the London Times devoted to a report and praise of Mr. Davies is wider than the regulation newspaper column in the United States. From another source, the Daily Times has obtained a copy of a letter which Mr. Blumenfeld recently wrote to Mr. Davies under date of June 23 and in which he makes mention of the book he is working on. Your contribution to the Allied cause is so much ahead of the average that I feel diffident in emphasizing it, for you have said all the things that wanted saying so effectively, so sensibly and so devoid of frills and embroidery that there is nothing more to be said by others, less qualified to speak. Here is an example in the form of an extract from yesterday’s Times in which your Columbus address to Governors is summarized with skill and judgment. I am proud to be able to proclaim you to all and sundry of my friends and acquaintances as a follow Watertowner. "You are keeping Watertown on the map and are making the old burg take on the appearance of a great center of wisdom, and exposition. Keep it up, and the next time you come over here on a mission (you do these things superlatively well) you must come down and put in a day or so with me in my medieval retreat where we may sit down and compare Watertown with Athens and ancient Welsh culture. I mention Wales and as I am still struggling with my boyhood reminiscences of Watertown in the '60s and '70s. I propose to call it “My Home Town" and a good deal of it is concerned with the 6th ward and its émigré citizens who came from all parts of Europe and I am doing my best to say nice things about the I Welsh settlement on the west side, the Davies, Evans, Jones, Howell, Griffith and so on contingent. I think it was your father Edward Davies, wasn’t it, who owned a wagon factory close to Manngold’s hotel; or was it on the next street by Bennett’s machine shop? I hope to finish the cursed thing one day. I have nothing to guide me except my memory and it is a long stretch back to 1864 when I first shook the 6th ward with my entry into this hectic live. About 50 years ago Ralph Blumenfeld left Watertown to seek his fortune elsewhere. His great ambition was to some day become an editor. It was long after leaving his home town that this ambition developed. He was picked up by the renowned James Gordon Bennett, the editor of the New York Herald, who later took him to Europe and placed him in charge of the Paris edition of the New York Herald, and still later he was picked up by the owner of the Daily London Express and made editor of that paper, which connection he still ably holds. Lately a banquet was held at the Hotel Victoria in London by 700 employees of the paper to celebrate Mr. Blumenfeld’s 25th anniversary on the paper, a fine testimonial heard of with pleasure here by his old Watertown friends. In the annals of newspaper work there were few men who rose to greater prominence and achieved greater success than Ralph D. Blumenfeld, the former Wisconsin boy who died recently after having been editor of the London Daily Express. Born in 1863 in Watertown, he was the son of David Blumenfeld, editor and proprietor of the Watertown Weltburger, a German language newspaper. The man, who was generally regarded as the doyen of Fleet Street, attended the public schools of Watertown until he was 11 years old, when he joined the force of telegraph messengers for the Western Union company. Like other ambitious young men, he learned telegraphy and was soon skillful enough to act as a substitute in several small towns in Wisconsin and Illinois. While acting as a substitute in Sycamore, III. he became acquainted with the president of a small railroad who took particular notice of the young man's ambitious ways and got a position for him in Kansas City, where he took press dispatches. In that capacity he gained the reputation of being the most skillful operator in that city, though he was only 15 years old at the time. Later young Ralph got a position in the Western Union office in Milwaukee, where his work was appreciated to such an extent that he was sent to New York, where he made the acquaintance of James Gordon Bennet, the famous publisher of the New York Herald. Bennett hired the young man and sent him to London to cover Queen Victoria's jubilee and later made him co-manager of the European office of the United Press association. London life was not agreeable at first to Blumenfeld and he returned to America to report the Garfield campaign for the New York Herald. Afterward he reported the proceedings of Congress at Washington for the Press association. When Congress adjourned, he was called to New York and accepted the night editorship of the Evening Telegram. After serving in that capacity for four months he transferred to the Herald as city editor. In 1890 he was sent to London to assume the editorship of the London edition of the Herald. In London the 27-year-old American newspaperman quickly found his feet. He had a flair for making quick, friendly contacts, especially with influential people. The days when his London lodging was a $10-a-week apartment with "use of bath if vacant," were an old memory. He had his manservant now, and in the house which he shared with three well known London personalities a butler served the wines. He was a highly paid and, as he subsequently admitted, a spoiled) young man. Blumenfeld was 29 when Bennet switched him to New York to act as business manager of the Herald. But Blumenfeld now wanted to live in England, and when the new Herald building was up he quit and went into the typesetting business, in which he made a lot of money. But one night he met a friend who remarked casually, "I hear you're in business now," and then turned his back on Bumenleld. "I didn't sleep all night," Blumenfeld later declared. "It taught me a lesson I hadn't learned all the years I'd been in journalism. It showed me that a journalist is as big as his paper, and outside of his paper, he's only as big as himself. That night I decided to get back into journalism. I should be a rich man today if I'd stayed in business, but I should have missed most of the things that make life, my life anyway, worth living." Northcliffe gave Blumenfeld a job as news editor on the Daily Mail. Then, in 1904, when he was 40, he went to the paper which was to be his mooring for the rest of his journalistic life. He became the editor of the Daily Express. Now he sat in a room in Shoe Lane, off Fleet Street, and looked down on that narrow ravine which offers more tributes to history than almost any other spot in London except Westminster Abbey and the Tower. Rudyard Kipling wrote prophetic letters to Blumenfeld and came to see him in Shoe Lane. Winston Churchill would ring up to explain his policy of holding up the budget. He was a power; he was also a personality. He got on well with everyone and was accepted everywhere. The Daily Express at that time was, in the editor's own phrase, underpowered and over-whistled. Max Aitken, a wealthy young man, became interested in the paper and put up $200,000 to keep it afloat. Aitken provided energy behind the paper, while R. D. B., as Blumenfeld became known in London, provided the wisdom, the experience, the poise, the indestructible prestige and much of the political acumen. The Express soon fought the Daily Mail to a standstill and boasted a circulation of 2,000,000 a day. R. D. B. now had a London flat and a country home. He had joined the happy and graceful life of a literary and artistic colony in Essex. His neighbors were artists, poets and writers, with a general and a scientist or two. One of his friends was H. G. Wells and much of the conversation in Well's book, "Mr. Britling" took in place in R. D. B. 's quiet garden. Suave, smiling, dark-eyed, soft-voiced, shrewd, subtle, with an ambassadorial presence and charm, R. D. B. has for many years spoken for the British newspaper world on many official and social occasions. He could have been Sir Ralph, but he declined the honor; he preferred the acknowledgment of election to the British Tory stronghold, the exclusive Carleton Club (he was the first Jew to be admitted to that august company). Very deep roots he put down in the country of his adoption, where he knew everybody who was anybody. But the faint, unmistakable accent remained. In 1932, after having been a dominant figure in international journalism, R. D. B. resigned the; editorship of the Express to devote himself to independent writing. He published two books, "R D. B. 's Procession," and "Home Town." The latter told of his 16 years in Watertown where the world famous editor first got the smell of printer's ink in his father's German language newspaper. 07 30 A portrait  of the late Ralph D. Blumenfeld has been added to the historical collections at the Octagon House. Mr. Blumenfeld who became known as “R.D.B.” to readers of British newspapers, was the author of several books, among them “Home Town” in which he recalled persons and events associated with early Watertown and his boyhood here. It was the most successful of his several books and went through numerous editions. Mr. Blumenfeld was born in Watertown in 1864 and died at his country estate, Great Easton, Dunmow, Muscombs, Essex in England in 1948. He served as editor of the London Daily Express from 1902 to 1933. He visited Watertown several times during his later years and each time went to Oak Hill cemetery to pause at the graves of his parents, Mr. and Mrs. David Blumenfeld. 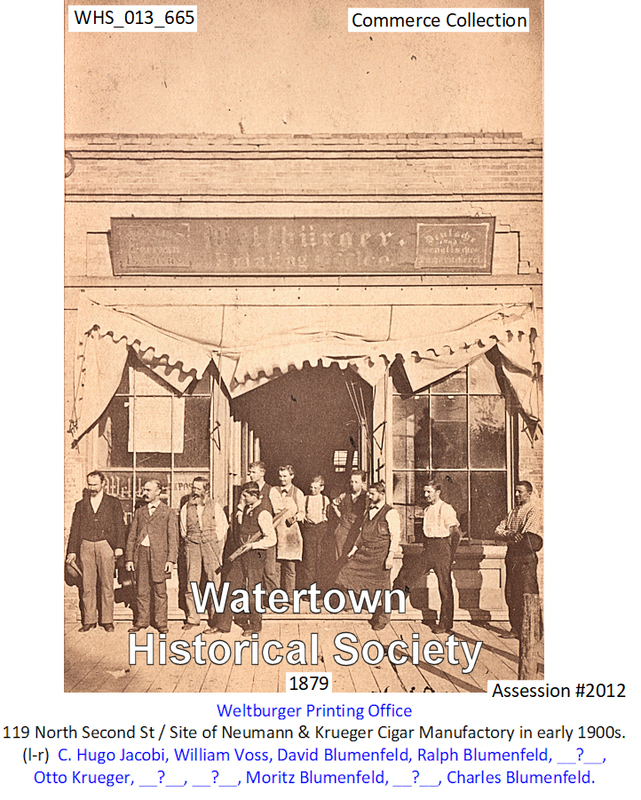 His father was for many years editor and publisher of the German language weekly here, the Watertown Weltbuerger. In May of this year we were treated to a visit from David Eliot, grandson of famed ex-resident Ralph David Blumenfeld, former editor of London Daily Express. Mr. Blumenfeld was born in Watertown in 1864 and rose through the ranks of the publishing business to become the editor of the newspaper with the largest circulation in the world. We were very honored to meet the soft-spoken Mr. Eliot and his traveling companion, Barbara Dicks. Both of them had been in the publishing business and while this wasn’t Mr. Eliot’s first trip to the States, it was his first visit to his grandfather’s birthplace and we were pleased to be on hand to greet him and show him some of the materials on his family that we held in our archives. He also toured our museum buildings and took a trip around town to visit spots that were important to his ancestors. His great-grandfather was David Blumenfeld, the founder and long-time editor of “Der Watertown Weltburger”, which was a German-language newspaper published in the city from 1857 to 1932. Today the original publishing firm that put out the paper continues as Wepco Printing on N. Fourth Street. While here we produced a photo of R. D. Blumenfeld and his grandsons, including Mr. Eliot taken in 1935 which he had fond memories of. He didn’t have a great deal to say about his famous ancestor, other than he was a kindly old gentleman, “who often gave me a sixpence”. We asked Mr. Eliot if he could investigate the copyright of his grandfather’s very excellent memoir “Hometown”, because we are very interested in reprinting this scarce resource as part of our “Hometown History Series” of publications. He stated that on his return to England he would look into the matter. We hope to hear from him soon and extend our desire to meet with him again one day soon.